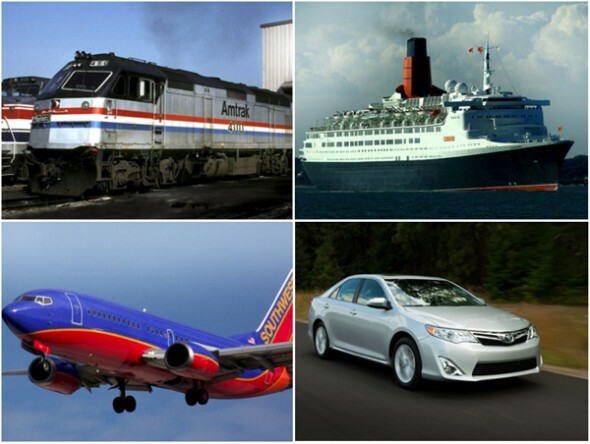 Just how much fuel does a plane, train, ship or car use to haul us around? The answer is surprisingly difficult to ferret out. 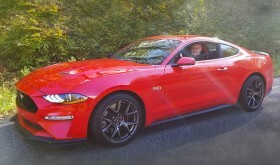 You can find BTUs per passenger kilometer and other techy figures, but searching for good ole “MPG” – or calculating it – takes some digging and a good bit of math. I think I’ve got it sussed in this blog. 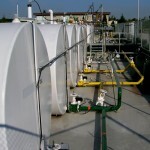 First, try to swallow this figure: We used 569 million gallons of petroleum to travel by air, land and sea in 2010 – the latest figure available from the Energy Department. And that’s only civilian use; not the military. That’s one heck of a lot of oil. 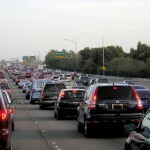 But let’s get back to the main question – which mode of transportation uses those millions of gallons most efficiently? Based purely on miles per gallon, cars look pretty good. According to the University of Michigan Transportation Research Institute (these organizations never have short names, do they? 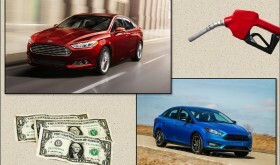 ), the average miles per gallon of 2012 model-year cars was 23.5 mpg – not a bad figure. 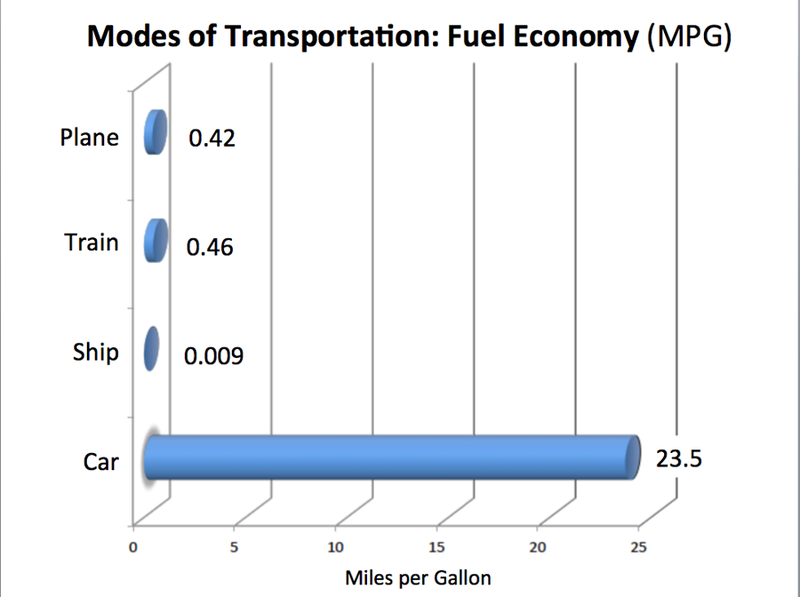 Commercial airliners and passenger trains get less than a half mile per gallon. Amtrak trains average 0.46 mpg. 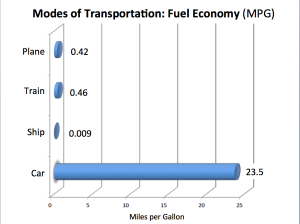 Airline “fuel economy” varies widely, from 0.28 to 0.55 mpg, depending on type of plane and distance traveled. (FYI: The venerable Boeing 737-300, on a 500 mile flight – say New York to Cincinnati – is one of the most efficient at 0.54 mpg.) The 0.42 mpg figure used in the chart is an average calculated by the Wall Street Journal in 2010. It’s no surprise that it takes a heck of a lot of fuel to lift a big airliner into the sky and fly at about 500 mph. But if we look at which mode of transport uses the most fuel, period, that would be cars and trucks. 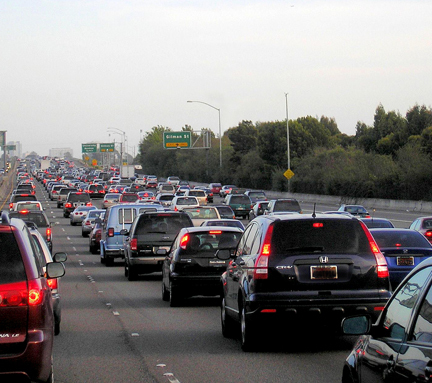 Of that 569 million gallons cited earlier, cars and trucks use over 85%. Planes use about 8%, ships about 5% and trains only 2%. 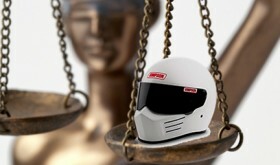 So the federal government’s push to increase automobile fuel economy is well placed. About now, the transportation geeks are howling: “You can’t carry a couple of hundred people in a car!” That’s true, so let’s insert one more figure into the mix – occupant capacity. The average commercial airline carries about 150 people, so a fully loaded plane can be rated at 63 Seat Miles per Gallon. That sounds more palatable, doesn’t it? Applying the same math to ships, say the Cunard Line’s QE2 with 1,777 passengers and 1,016 crew, brings its Seat MPG up to 25 – not too shabby. Put five people in a car that gets “average” fuel economy, and you come up with a Seat MPG of 119 – now we’re talking. But Amtrak definitely trumps them all. 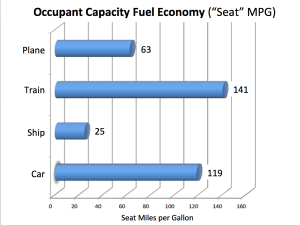 With an average of 238 seats, an Amtrak passenger train can boast 141 Seat MPG. Are all planes full? Most of the flights that I’ve been on are. I don’t know about cruise ships, but I’ve also been on plenty of packed Amtrak trains here in the NE Corridor. 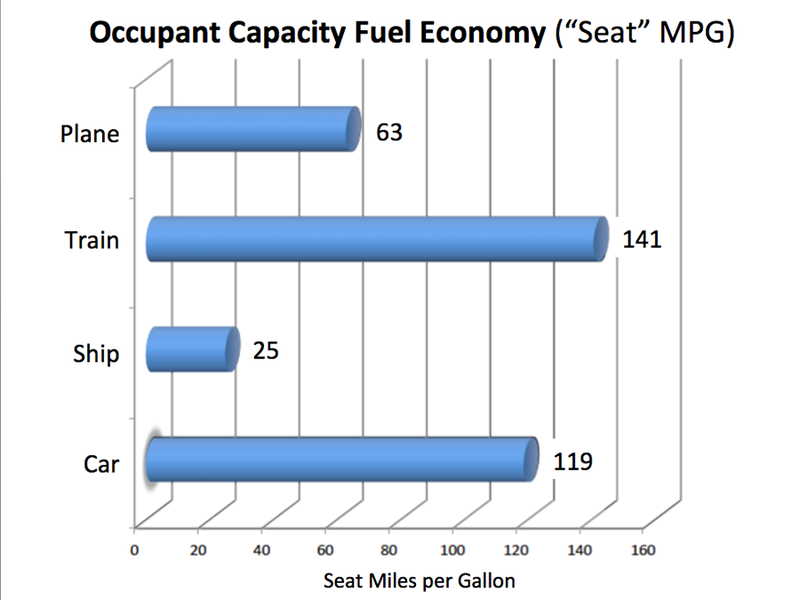 My point is, planes and trains do a pretty good job of actually achieving these calculated Seat MPG figures. Cars? Not so much. Most cars I see, even on interstates, have maybe two people in them. 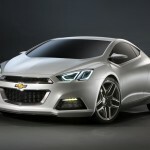 That’s not very efficient in the scheme of things, and this reality starts to chip away at cars’ fuel economy advantage. But wait, there’s change in the wind. By federal mandate, cars will be getting more and more fuel-efficient over the next 10 to 15 years. Planes have made big efficiency gains as well, in some cases posting a 40% increase in the last 15 years. Ships and trains can’t seem to match these figures. Slippery hull designs and fuel-efficient engines haven’t yielded dramatic improvements in sea-going vessels. And intercity trains can only inch ahead slightly with the latest engineering tricks – perhaps 3 to 5% increases by some estimates. That may be due to weight. Even the newer Amtrak Acela weighs 4,100 pounds per passenger seat. 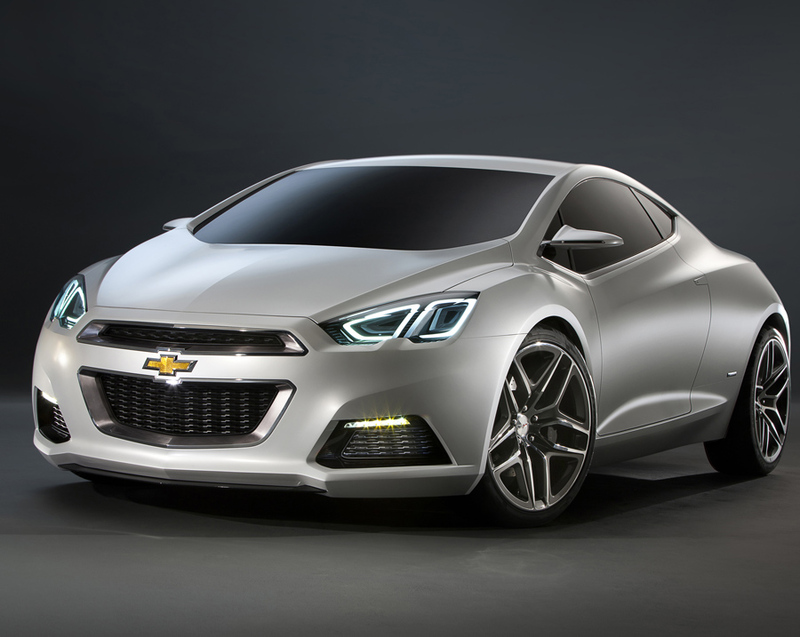 The future efficiency champ may well be the car. In fact, according to one analysis for the Cato Institute, by 2030 the average car will use less energy per passenger mile than Amtrak. Now we just have to convince more people to ride along in these hyper-efficient future cars. • I did not try to calculate the fossil-fuel equivalent of electric vehicles, including what may be the most efficient form of transportation – intracity rail. This is all about petroleum users. 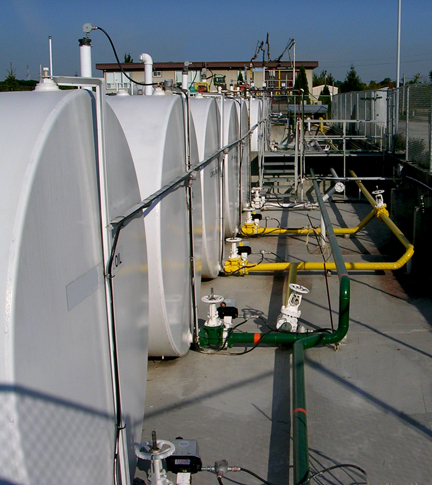 • For calculations on ship fuel economy, I assumed 1 metric ton of bunker fuel equals approximately 273 gallons.